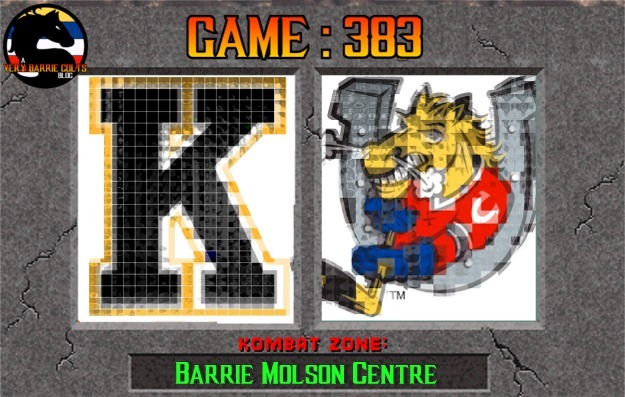 Game Preview: Barrie Colts vs Kingston Frontenacs. #OHL - Very Barrie Colts | A website covering the Barrie Colts of the OHL. Tonight the Barrie Colts (23-12-2-1) face-off against the Kingston Frontenacs (18-13-3-3) for the first of four meetings this regular season. Both teams are looking to snap losing streaks, with Barrie losing their last 2 and Kingston losing 3 straight. Kingston is coming off of a 4-3 loss against the Windsor Spitfires last night in Kingston. The Fronts came out of the gate with a quick goal from Ryan Cranford. Linus Nyman would add a couple goals late in the period to give Kingston a 3-1 lead. The Spitfires scored 3 goals to start off the 3rd period in the first 4:30 of the frame and that would be enough to get the win. Cody Morgan would get the game winning goal. The Fronts dominated the face-off circle, winning 40 of 56 draws. They also out-shot Windsor 32-24. Jeremy Helvig started between the pipes for Kingston and made 20 saves. Kingston was unable to score on 3 man advantages but were able to kill a pair of penalties. AND FORMER BARRIE COLTS FORWARD, AND RYANS FAVOURITE, CURTIS DOUGLAS WAS NAMED THE GAMES FIRST STAR! WE MISS YOU, DOUGIE!!! Sorry about that.. Okay, we back. Barrie lost to London Thursday night at home 5-3. The Colts dominated play at times and were strong offensively, out-shooting the Knights 43-21. Andrei Svechnikov scored a goal and added 6 shots in his first game back since playing for team Russia at the World Junior Championship. TJ Fergus and Jaden Peca also added goals on the night. Kai Edmonds got the start and made 16 saves. He looked good, despite a lack of generated shots by London. Colts went 1 for 3 on the power-play. They are 18.3 PP% this season is 14th in the league. You gotta think, that a team with the 4th most goals league wide and the leagues goal leader will eventually find a way to connect on the man-advantage. Barrie is 12-6-0-1 at home, while Kingston is 7-10-1-2 on the road. Leo Lazarev left Tuesdays game after making a pad save and appeared to pull something. I would look for him to return tonight and get the start, but the team has yet to say anything about his status, or who is starting tonight. OH, AND CONGRATS TO CANADAS WORLD JUNIORS ON WINNING GOLD!